The design principles of Kayak . Home > News > The design principles of Kayak . Typically, kayak design is largely a matter of trade-offs: directional stability ("tracking") vs maneuverability; stability vs speed; and primary vs secondary stability. This is true for single hull (a.k.a. mono-hull) kayaks, but does not necessarily encompass newer types of hulls, such as twin hulls. As a general rule, a longer kayak is faster. See Hull speed. Kayaks that are built to cover longer distances such as touring and sea kayaks are longer, generally 16 to 19 feet (4.9 to 5.8 m). With touring kayaks the keel is generally more defined (helping the kayaker track in a straight line.) Whitewater kayaks, which generally depend upon river current for their forward motion, are short, to maximize maneuverability. These kayaks rarely exceed 8 feet (2.4 m) in length, and play boats may be only 5–6 feet (1.5–1.8 m) long. Recreational kayak designers try to provide more stability at the price of reduced speed, and compromise between tracking and maneuverability, ranging from 9–14 feet (2.7–4.3 m). Primary (sometimes called initial) stability describes how much a boat tips, or rocks back and forth, when displaced from level by paddler weight shifts. Secondary (final) stability describes how stable a kayak feels when put on edge or when waves are passing under the hull perpendicular to the length of the boat. Primary stability is often a big concern to a beginner, while secondary stability matters both to beginners and experienced travelers. By example, a wide, flat-bottomed kayak will have high primary stability and feel very stable on flat water. However, when a steep wave breaks on such a boat, it can be easily overturned because the flat bottom is no longer level. By contrast, a kayak with a narrower, more rounded hull can be edged or leaned into waves and (in the hands of a skilled kayaker) provides a safer, more comfortable response on stormy seas. The most important attribute in determining the stability of a single hulled kayak is the overall width of its cross section. The shape of the cross section can affect both maneuverability and stability. Hull shapes are categorized by roundness/flatness, whether it has a "V" shape at various points, and by the presence and severity of a chine, where the side and bottom of a hull meet at an angle, creating an edge below the gunwales. This cross–section may vary along the length of the boat. Kayaks with only moderate primary, but excellent secondary stability are, in general, considered more seaworthy, especially in challenging conditions. A V-shaped hull tends to ease traveling straight (track), but makes turning harder. V-shaped hulls also have the greatest secondary stability. Conversely, flat-bottomed hulls are easy to turn, but harder to direct in a constant direction. The chine typically increases secondary stability by effectively widening the beam of the boat when it heels (tips). Sea kayaks, designed for open water and rough conditions, are generally narrower 22–25 inches (56–64 cm) and have more secondary stability than recreational kayaks, which are wider 26–30 inches (66–76 cm), have a flatter hull shape, and more primary stability. Symmetrical: the widest part of the boat is halfway between bow and stern. Fish form: the widest part is forward (in front) of the midpoint. Swede form: the widest part is aft (behind) midpoint. Length alone does not fully predict a kayak's maneuverability: a second design element is rocker, i.e. its lengthwise curvature. A heavily rockered boat curves more, shortening its effective waterline. For example, an 18-foot (5.5 m) kayak with no rocker is in the water from end to end. In contrast, the bow and stern of a rockered boat are out of the water, shortening its lengthwise waterline to only 16 ft (4.9 m). Rocker is generally most evident at the ends, and in moderation improves handling. Similarly, although a rockered whitewater boat may only be a few feet shorter than a typical recreational kayak, its waterline is far shorter and its maneuverability far greater. When surfing, a heavily rockered boat is less likely to lock into the wave as the bow and stern are still above water. A boat with less rocker cuts into the wave and makes it harder to turn while surfing. Some recreational kayak makers try to maximize hull volume (weight capacity) for a given length as shorter kayaks are easier to transport and store. Many paddlers who use a sit-in kayak feel more secure in a kayak with a weight capacity substantially more than their own weight. Maximum volume in a sit-in kayak is helped by a wide hull with high sides. But paddling ease is helped by lower sides where the paddler sits and a narrower width. A narrower kayak makes a somewhat shorter paddle appropriate and a shorter paddle puts less strain on the shoulder joints. Some paddlers are comfortable with a sit-in kayak so narrow that their legs extend fairly straight out. Others want sufficient width to permit crossing their legs inside the kayak. Traditional-style and most modern types of kayaks (e.g. sit-on-top) require that paddler be seated with their legs stretched in front of them, in a right angle, in a position called the "L" kayaking position. Most modern kayaks feature a system comprising footrests and a backrest, designed to provide the paddler with means to support their paddling effort by allowing them to push the footrests with their feet, and the backrest with their lower back (lumbar spine). Such arrangements were not included in kayaks made by native peoples of the arctic regions, who were fit enough to paddle their kayaks without needing such devices. 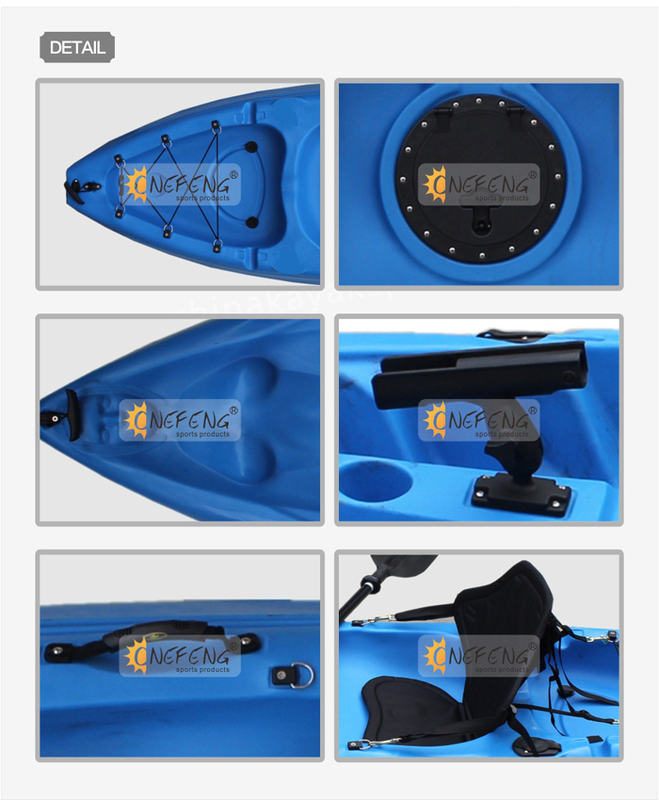 These devices are not required in new twin hull kayaks of the "W" type that offer a different sitting position called the "Riding" position, in which the paddler's legs are not stretched out in front of them.